Easily learn how to pronounce and spell difficult medical terms and words. 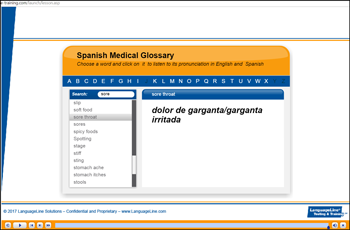 The Medical Terminology WordBook is an online practical resource to help interpreters build knowledge and fluency in the medical field. As a result, it raises the quality standards to better meet regulatory requirements, increases patient satisfaction and preserves patient safety. This practical resource helps expand skills to properly speak challenging medical verbiage in English and the equivalents in the target language. By clicking on the word in the glossary, you can hear the correct pronunciation and view the accurate spelling of each word. You can search for a specific term or browse alphabetically. And, to further expand terminology knowledge, each term in the glossary will also display a definition in English. It is also an excellent preparation method for interpreter certification tests and the Bilingual Fluency Assessment for Clinicians, as well as effective consultation material. Click here to register for the Medical Terminology WordBook. To schedule a LanguageLine training course and for more information, contact your Account Executive or LanguageLine Testing and Training at LLA@LanguageLine.com or (877) 351-6636.